As usual with my Christmas gift list, I've chosen things that are modestly priced but highlighted some things a little higher up the price scale for those who like to spend a bit more on their very own food-lover. Many of the gifts can be bought on-line but, as I live in London, I've mentioned where they can be bought over the counter in the capital. Most of the sources are small businesses. I hope this list gives you some inspiration. A beautifully wrapped packet of tea blended with care. My choice would be from my favourite tea blender My Cup of Tea. Maybe the slightly malty-flavour of the 2nd flush Assam Halmari at £15/100g, a special Uji Gyokuro green tea with a lovely balance of sweetness and mild bitterness at £40/100g or a pack of Spicy Turkish Apple Muslin Teabags at £14. In addition to the delicious blends of tea and tisane, this shop is a treasure trove of beautiful individual tea-related gifts. 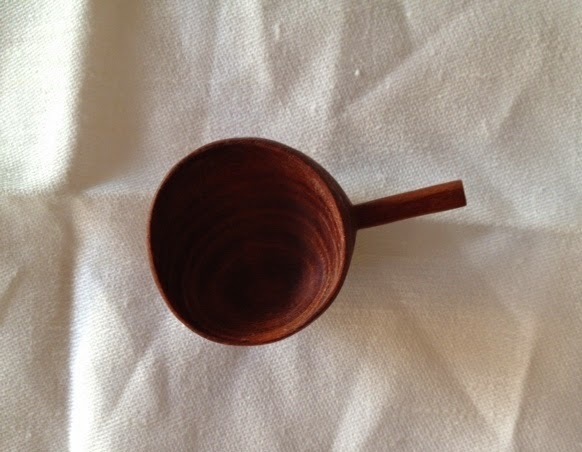 A wooden scoop hand-carved from a single piece of wood. Each one is subtly different reflecting the nature of the natural material £18; a Japanese hand-thrown tea bowl, around £40; a Japanese handmade Cherrywood tea caddy, around £80. A packet of coffeee beans or ground coffee. My favourite at the moment is Monmouth Coffee Company's Sukari from Kabare Town Mt. Kenya with a lovely light acidity for £27 kg and an outstanding mountain water-process decaffeinated organic Granja La Esperanza from Colombia which I've taken to drinking at night. It has lovely toffee flavours and low acidity £26 kg. Monmouth don't do gadgets but you can pick up a ceramic filter for £9 or my favourite Pannetone made by the Ulcigrai family near Trieste for £17 (imported by Leila McAlister and also,stocked at her shop on Calvert Avenue E2). 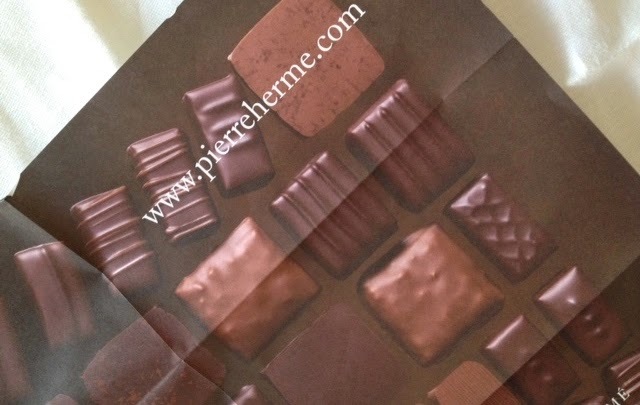 Macarons or chocolates are always welcome at any time of year and Pierre Herme does both very, very well. You can buy them in various box sizes or just a few in a packet (budget around £1.90 per macaron). The chocolates are top-notch and I'd advised including some of the Infinement Vanilla with its combination of Tahitian, Mexican and Madagascan vanillas - a box works out at just under £2 per chocolate. There's also a small collection of exquisite cakes £15-20. New branch just opened on Monmouth Street, Covent Garden. Leila's Shop (and Cafe) on Calvert Avenue E2 is a great little place for gifts for food-lovers. 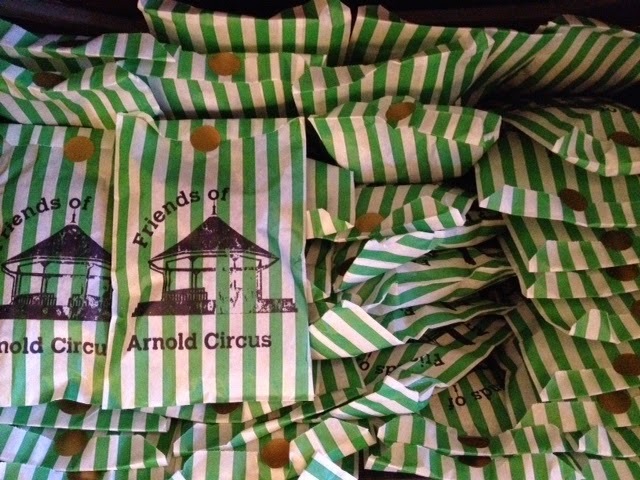 Look beyond the baskets of fantastic fruit and veg and you'll find gifts like a £1 packet of Hollyhock Seeds gathered from the nearby public amenity garden Arnold Circus - all proceeds go to the Friends of Arnold Circus charity. Boxes of Colavolpe chocolate-coated clementines are £10 and boxes of sticky Calabrian figs are £9.80-£12. Here too you'll find stainless steel Arnold Circus Water Bottles for £10 - proceeds from sales go towards a drinking-water fountain for Arnold Circus. British company David Mellor has been making cutlery and kitchen products in Sheffield since 1969. Their shop, just off Sloane Square, is the place to go if you're looking for quality. 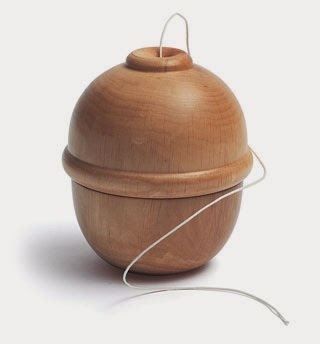 This acorn-shaped Alderwood String Box caught my eye at £23. There are David Mellor glass bowls in a range of jewel colours 10-13cm priced at £16-24 each. Wooden products are a bit of a feature including the work of Irish woodturner Liam O'Neill whose bowls are made using timber only from trees felled through old age or natural disaster and range in price from £29-£134. 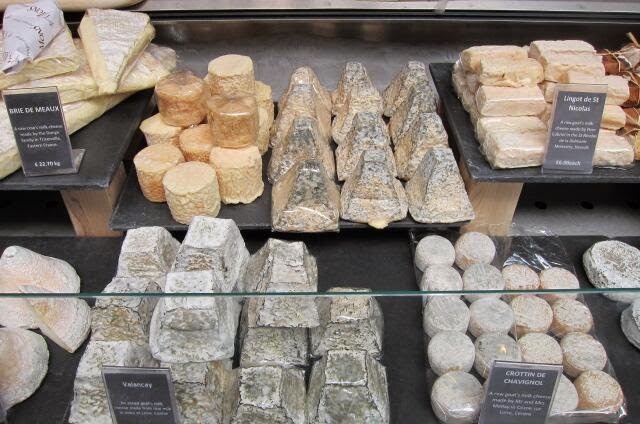 Mons Cheesemongers is the place I'd head to for a selection of French cheeses. Ones I'm enjoying right now are an unpasteurised goat's milk Charolais with a mineral nuttiness at £8.90 each, a buttery pasteurised cow's milk Persille du Beaujolais at £22 kg and a fruity raw cow's-milk Beaufort at £33.60 kg. Also, it's the season for Vacherin Mont d'Or and Mons have a fantastic one at £11.95 (11cm size). This is my last posting of the year so, to all of you who are celebrating, Happy Christmas and see you in 2015.